A Superior Air Conditioning is excited to share the success of their Choose Your Charity Program during the first seven months of 2017. The program started in January of 2017 and has already given over $36,000.00 to Non-Profit Organizations across Okaloosa, Walton and Bay Counties! Their goal for 2017 is to donate at least $50,000.00 and they are well on their way to making that happen. “Last year, after we finished giving away the 3rd quarter air conditioning system, through our Vets Helping Vets and First Responders Program, I felt the need to do more in our community. I started thinking of ways to make a bigger impact and I was reminded of a conversation with my wife, Marta, from two years earlier. She had the idea to let the customers we serve give a portion of their invoice to a charity of their choice. It took a few years to make sense, but in that moment the Choose Your Charity Program was put into motion”, says Jimy Thorpe. 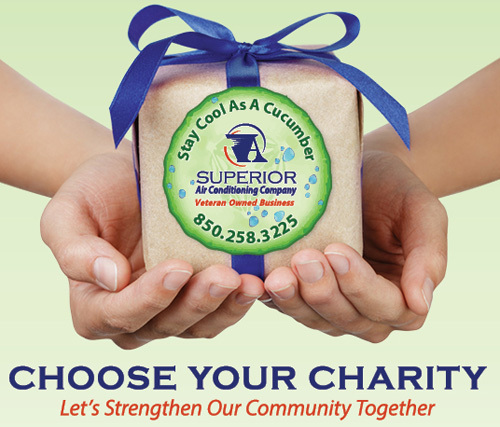 The Choose Your Charity Program is made possible by the customers of A Superior Air Conditioning Company. A portion of each service performed is designated to the local charity of the customer’s choice. The exact amount donated per service can be found below. If the customer is unsure of where to donate, that same amount, is put towards a community fund and is used as needs arise. A Superior Air Conditioning has supported the mission of over 75 local nonprofits serving a very diverse population along the Emerald Coast. Supporting the community in which they operate is a top value of A Superior Air Conditioning Company and they feel lucky that their customers support these efforts. Follow their giving by liking their page on Facebook and clicking the Hashtag #ChooseYourCharity. For more information, please visit www.asuperiorac.com.